Or, get it for 20800 Kobo Super Points! This study argues against vague interpretations of fantasy as mere escapism and seeks to define it as a distinct kind of narrative. 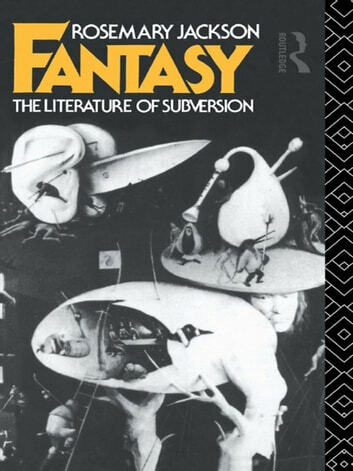 A general theoretical section introduces recent work on fantasy, notably Tzventan Todorov's The Fantastic: A Structural Approach to a Literary Genre (1973). Dr Jackson, however, extends Todorov's ideas to include aspects of psychoanalytical theory. Seeing fantasy as primarily an expression of unconscious drives, she stresses the importance of the writings of Freud and subsequent theorists when analysing recurrent themes, such as doubling or multiplying selves, mirror images, metamorphosis and bodily disintegration.^l Gothic fiction, classic Victorian fantasies, the 'fantastic realism' of Dickens and Dostoevsky, tales by Mary Shelley, James Hogg, E.T.A. Hoffmann, George Eliot, Henry James, Joseph Conrad, R.L. Stevenson, Franz Kafka, Mervyn Peake and Thomas Pynchon are among the texts covered. Through a reading of thse frequently disquieting works, Dr Jackson moves towards a definition of fantasy expressing cultural unease. These issues are discussed in relation to a wide range of fantasies with varying images of desire and disenchantment.